A doubledecker InterCity / InterRegio train of the type VIRM, made by Talbot/Bombardier. 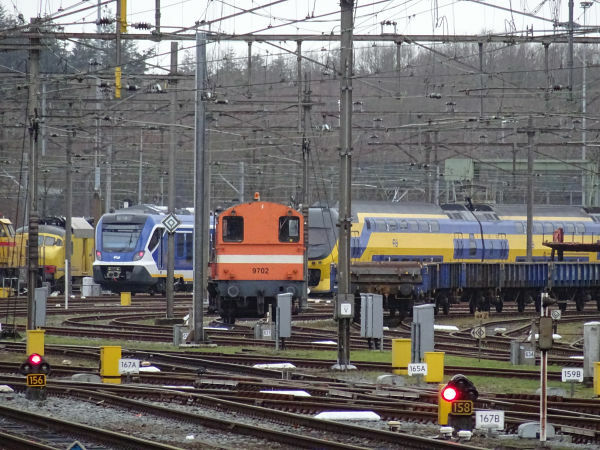 These are today the most common long distance trains in the Netherlands. They come in two variants, a four coach and a six coach trainset. 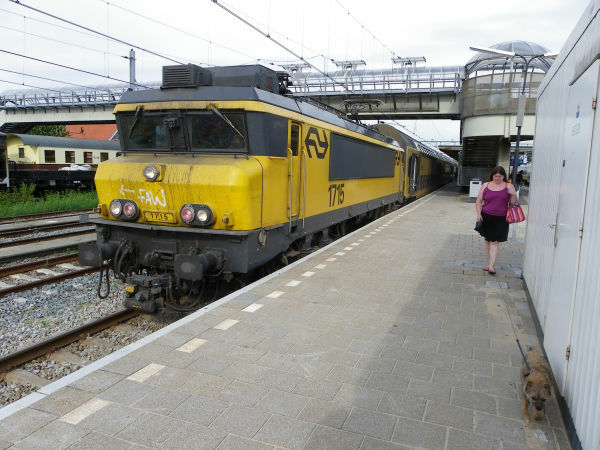 Picture of a four coach VIRM train at Hoorn 16.7.2010 by Ilkka Siissalo. A six coach VIRM InterCity trainset at the station of Leeuwarden. Picture 16.7.2010 by Ilkka Siissalo. 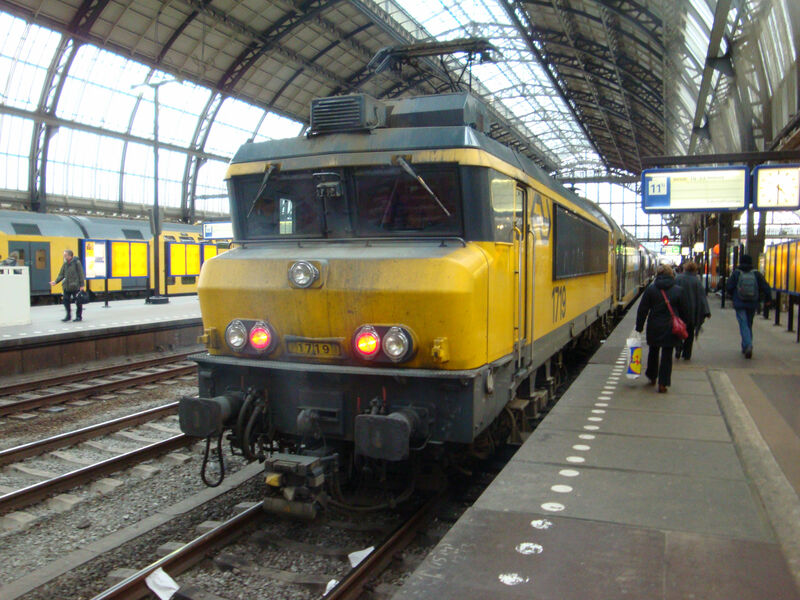 The front of a VIRM train. Picture from Leiden Centraal station 8.10.2015 by Ilkka Siissalo. 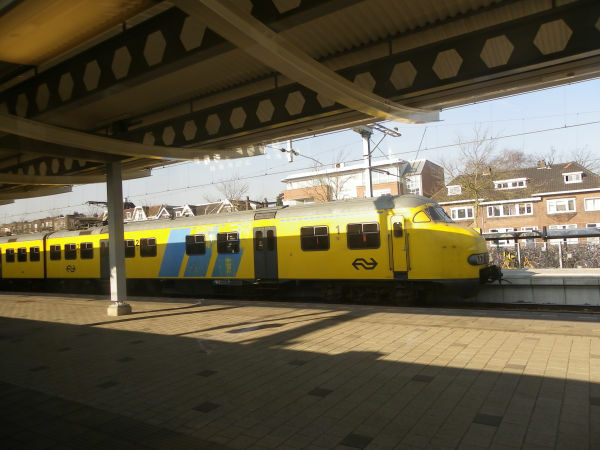 Before the VIRM trains this model was the fastest and finest of Holland's IC trains. This is the so called ICM, Intercity Materieel. They were built by Talbot and taken into use in 1977. 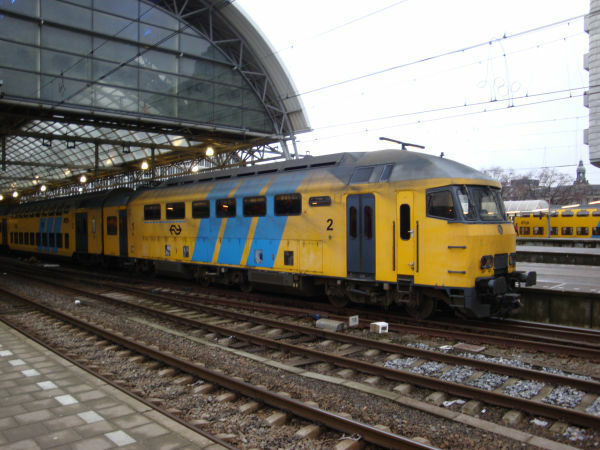 The trains are best known by their nickname "Koploper". 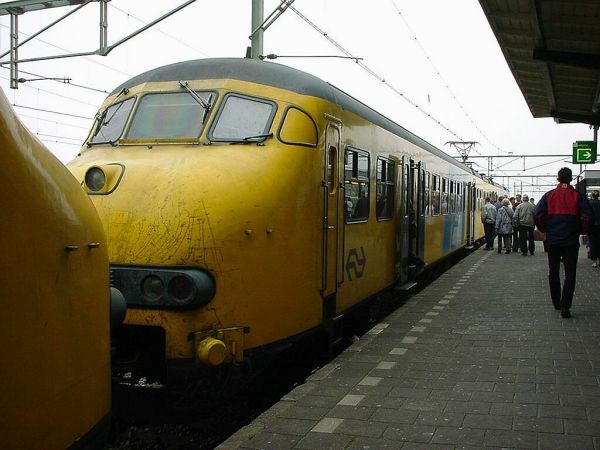 The word means literally head runner, somebody running in front of the pack, but the name refers also to the peculiar head form of these trains. The drivers cabs were lifted up and there were large front doors, which allowed people to move freely even between units when several Koplopers were attached to each other. But now all Koplopers have gone through a renovation programme, where the front doors were rendered inoperable. There are two series of Koploper trains. Class 4000 takes 35 1st class and 163 2nd class passengers and has a power rating of 1248 kW. Class 4200 Koplopers take 59 1st class and 198 2nd class passengers and have a power rating of 1872 kW. Class 4200 is four coaches and class 4000 three coaches long. 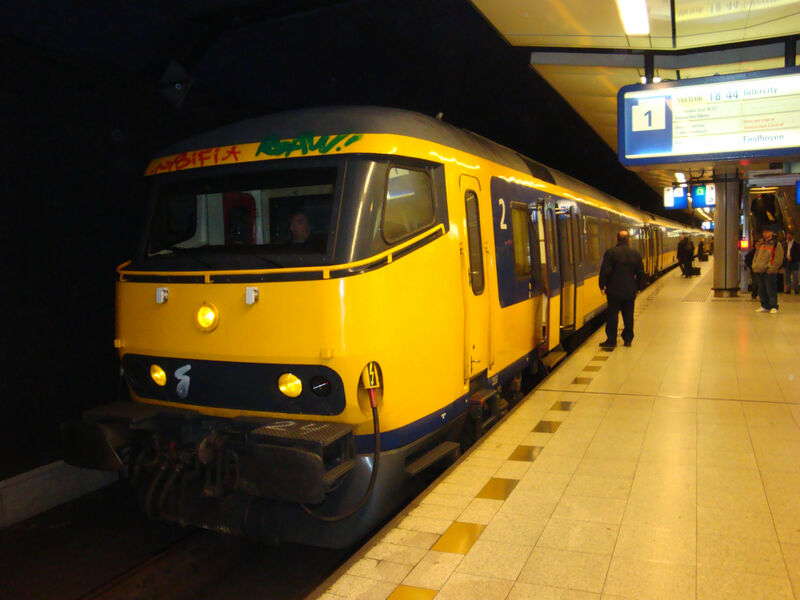 This one is a modernised class 4200 Koploper. NS locomotive 1715 is a class 1700 locomotive of the state railways. 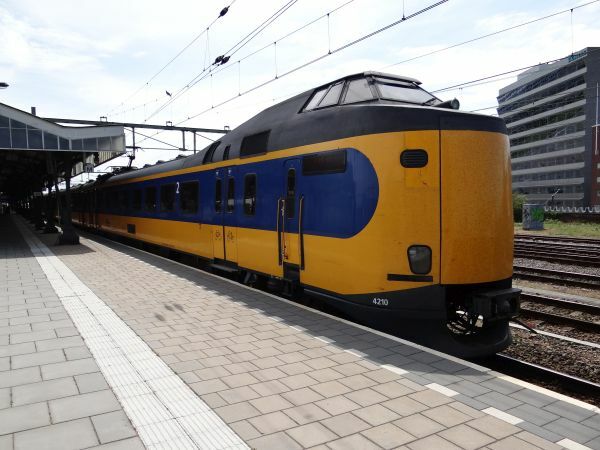 They were built by Alstom 1990-94 in 81 copies and are today the most common electric locomotives in the Netherlands, being used by both the NS and also DB Cargo. It is a machine which in theory is 200 km/h fast, in practise 160 km/h. It has a power rating of 4600 kW. But it can only run under 1,5 kV DC. It is a further development of the earlier class 1600, which in turn is a further development of the French class BB7200. 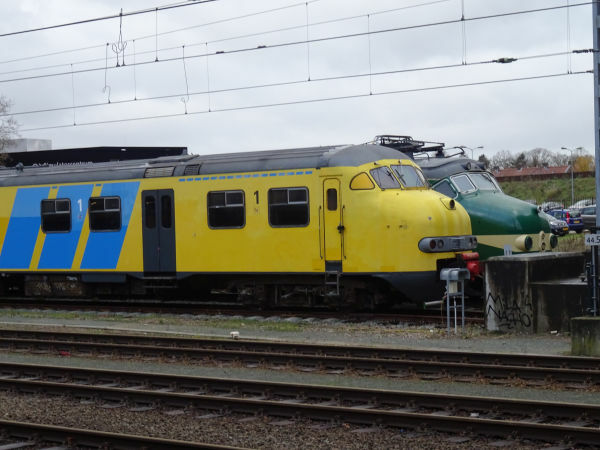 It is easy to see that the class 1700 and the earlier French BB7200 look pretty much alike. Picture from the station of Hoorn 16.7.2010 by Ilkka Siissalo. The lady in the picture is train photographer Sanna Siissalo, with our former train spotter dog, terrier Tau, which joined us in train sniffing tours in 19 countries. Picture of a classical Dutch InterCity at Schiphol airport 9.3.2009 by Ilkka Siissalo. NS ordered together with Belgian state railways jointly new trains of the so called V250 class from AnsaldoBreda of Italy, but that turned out to be a miserable mistake. First the trains were years and years late and when finally some of them entered service, within weeks it turned out that they were of so lousy quality that they were finally returned to the manufacturer. While waiting NS had to organise its traffic to the south using this kind of trains, with a Bombardier TRAXX locomotive of the class E186 and with old, partly refurbished express train coaches. These trains have now become the new norm. These E186 Bombardier TRAXXes can run both on 1,5 kV DC as well as 25 kV AC and also using the modern ERTMS security systems. Picture of a TRAXX E186 at Amsterdam Schiphol airport station 8.10.2015 by Ilkka Siissalo. This is how the AnsaldoBreda V250 trains looked like. The outer design was made by the famous company Pininfarina. 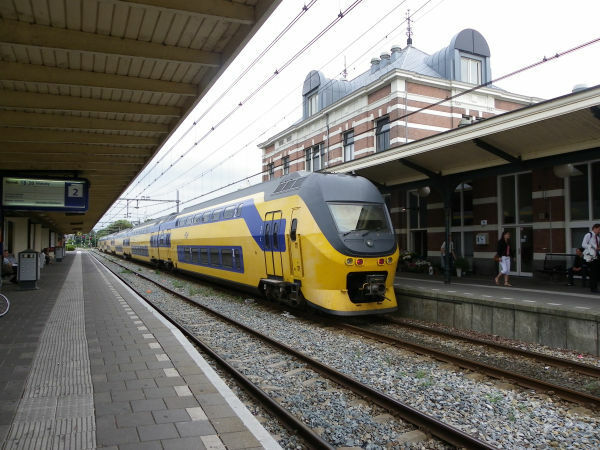 NS of the Netherlands and Belgian state railways NMBS ordered together 19 of these trains. They were ordered in 2004 and delivery should have been 2007. 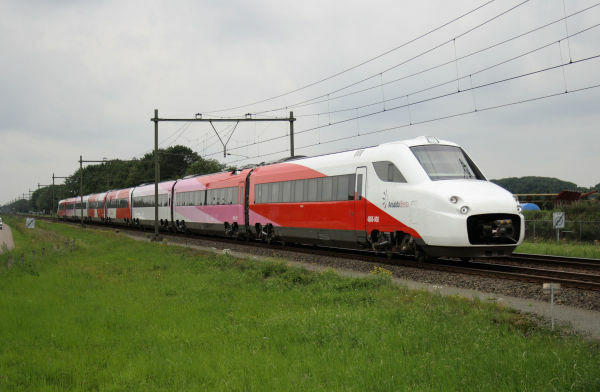 NS and NMBS had set up a daughter company called HSA, High Speed Alliance to operate these trains and well before the delivery of the trains HSA had invented a trade name for this service. The name was Fyra. It is a Swedish language word meaning four and it referred to the four major cities that these trains were supposed to connect. 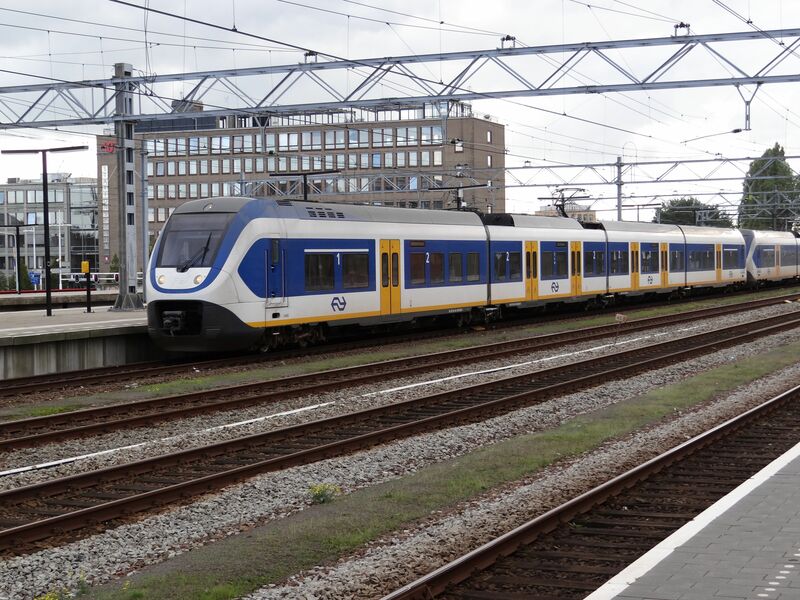 When 9 out of 19 ordered trains were finally delivered in December 2012 and they were taken into service, only 39 days later they were taken out of use, their operations certificate was cancelled, NMBS cancelled their order and NS started litigation against the manufacturer. Pieces of the trains fell off, doors wouldn't shut and the list of quality problems was so long that it was even hard to believe. The trains had for example extensive corrosion damages even before they were taken into use. There was no quality whatsoever and all the trains were different. All the trains delivered were returned to the manufacturer, which finally went bankrupt. Finally it was announced that the Italian state railroads FS Trenitalia had in 2017 bought all 19 units and tries to fix and use them. While waiting for the V250 trains which were years and years late and finally turned out to be total rubbish, the High Speed Alliance HSA wanted already to start marketing and start promoting their new marketing trade name Fyra intended for the new V250 trains. HSA rented Bombardier TRAXX E186 locomotives and used them together with old Dutch and Belgian express train coaches painted in the red and white Fyra colours as their "temporary Fyra trains". 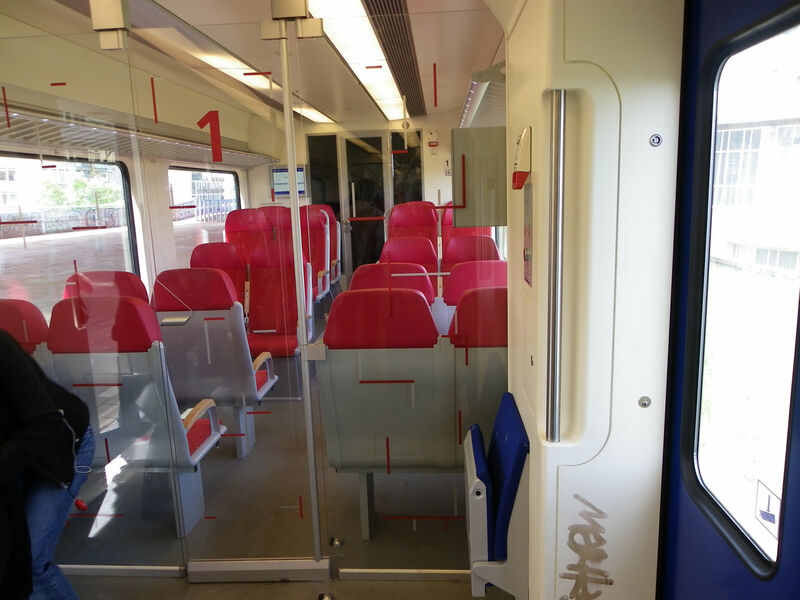 But the Fyra tickets contained a hefty additional price and passengers did not see much benefit in just the red colour as these trains were far slower than the service promised. When the V250 trains proved to be a big time Italian style Fiasco with a capital letter, HSA finally went bankrupt. 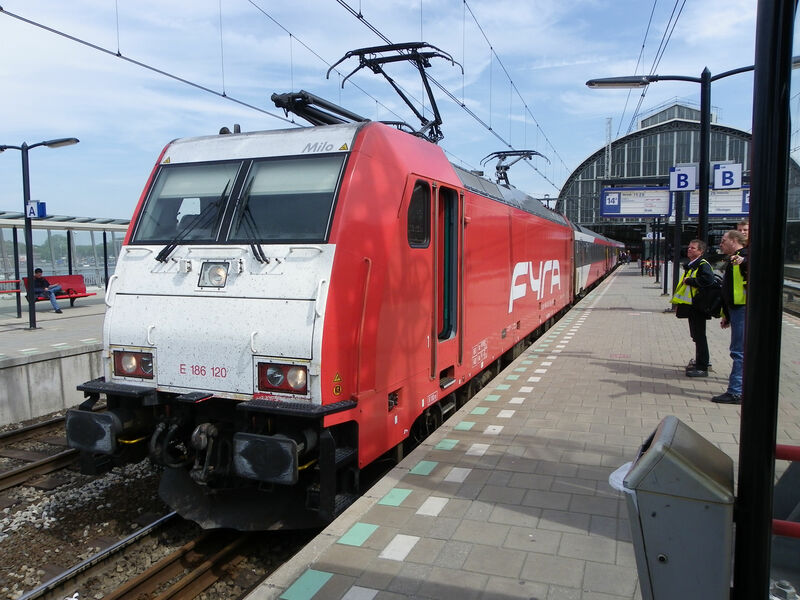 Picture of a TRAXX E186 locomotive with Fyra colours at Amsterdam Centraal 23.5.2011 by Ilkka Siissalo. Driver's cab of a Bombardier TRAXX Br186 locomotive. Acceptance to drive 160 km/h in NL, B and A and 140 km/h in DE, but still it was a cargo machine in the first place. 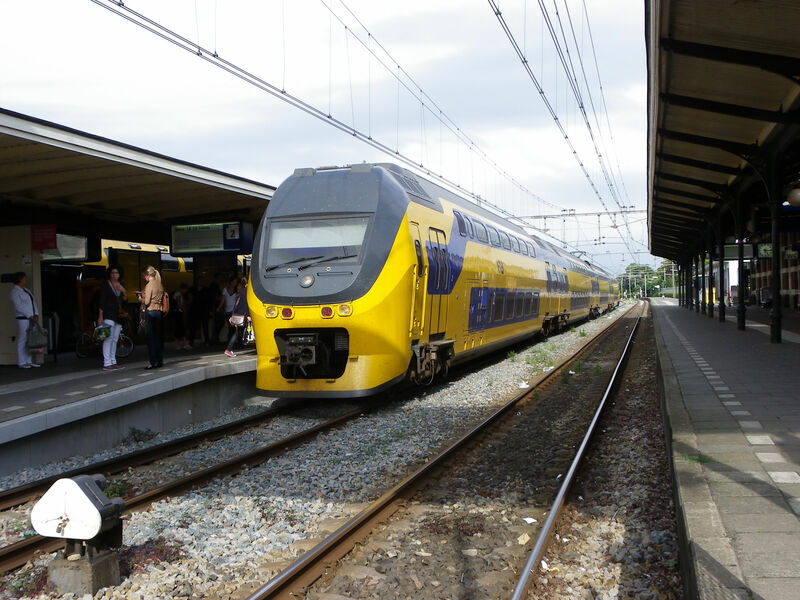 But the important thing is, it has the acceptance for using it on the new fast track systems including the famous HSL Zuid, high speed link south, southwards of Amsterdam, towards Belgium. That is a 25 kV 50 Hz stretch of rail requiring the newest ERTMS standard safety systems. Not all locomotives can do this. The TRAXX E186 is a four electric system machine for 1500V and 3000V DC, 16 kV AC 15,67 Hz and 25 kV AC 50 Hz. Picture of a Bombardier TRAXX E186 locomotive with Fyra colours at Amsterdam Centraal 23.5.2011 by Ilkka Siissalo. 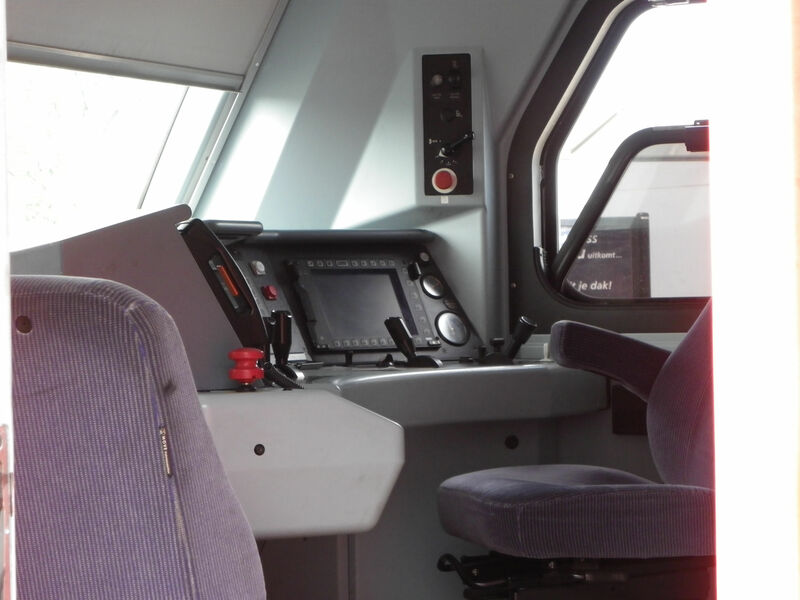 The driver's desk of a modern Bombardier TRAXX locomotive looks fairly easy to use even for a total stranger. While under ERTMS control, all the location and track related commands come via a computer and the rest is a bit like controlling a computer game. 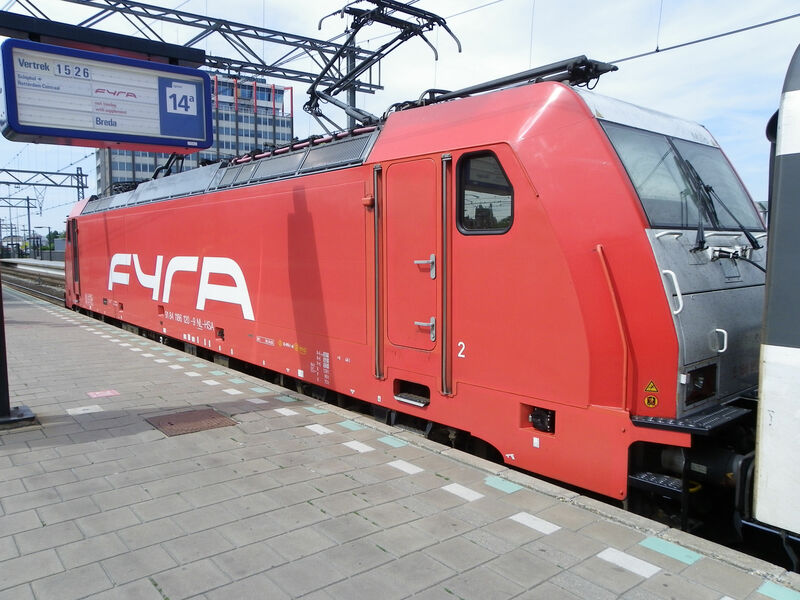 Another picture of the HSA E186 locomotive and its Fyra train. Although these TRAXX locomotives were accepted for use at up to 160 km/h, they still were originally cargo machines and not real bullet trains. And even as this is being written in 2018 these same locomotives and same old coaches still operate on the same line, but now they have lost their Fyra name and the red and white colours. 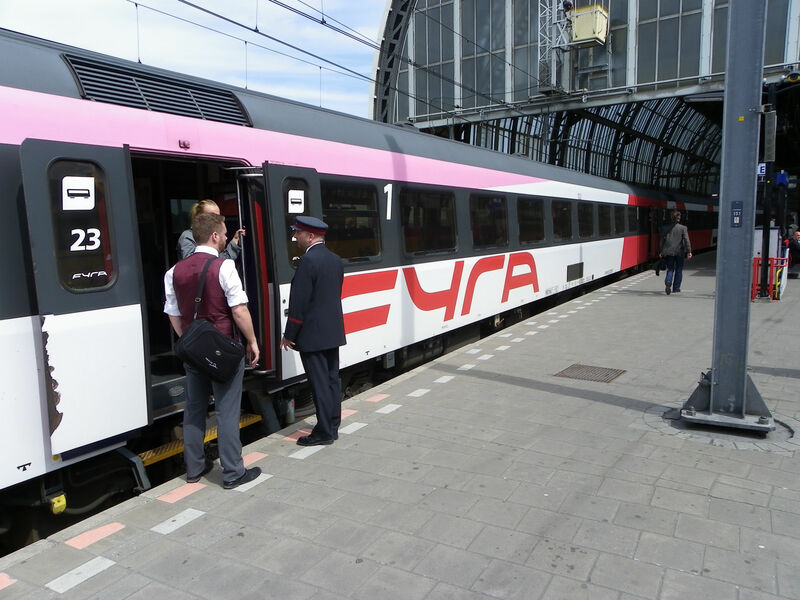 Picture of an old coach with Fyra colours at Amsterdam Centraal 23.5.2011 by Ilkka Siissalo. 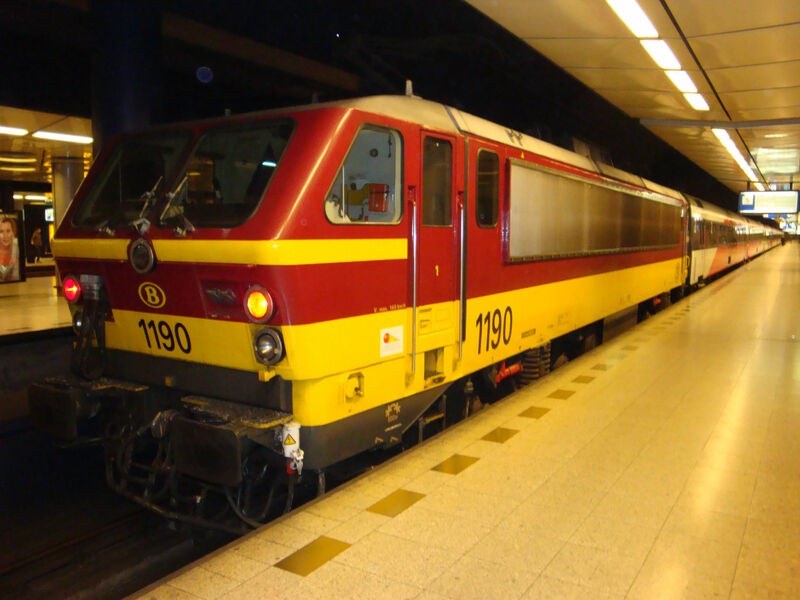 In the early days of the not so lucky HSA High Speed Alliance, HSA did not yet have enough of even the rented TRAXX locomotives and many of the initial Fyra trains were pulled or pushed by Belgian state railways locomotives, just like here a Belgian locomotive 1190 is pushing a Fyra train towards Amsterdam. Picture from Schiphol airport 9.3.2009 by Ilkka Siissalo. This is an NS Sprinter Lighttrain of the class 2400. They are used especially in short commuter train connections near Amsterdam. 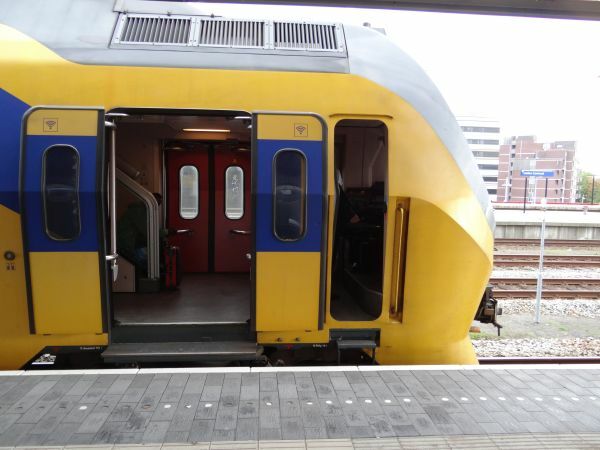 These trains were built 2007-12 and there are 69+62 of them in use. They were built by both Bombardier (class 2400) and Siemens (class 2600). 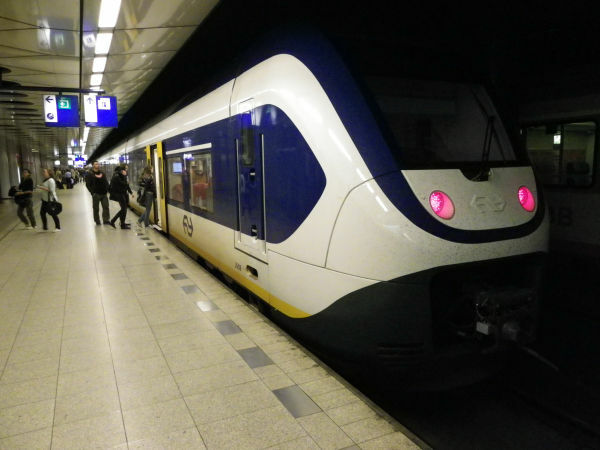 People boarding a class 2600 Sprinter train at the underground station of Schiphol Amsterdam airport. Picture from Schiphol 18.5.2011 by Ilkka Siissalo. 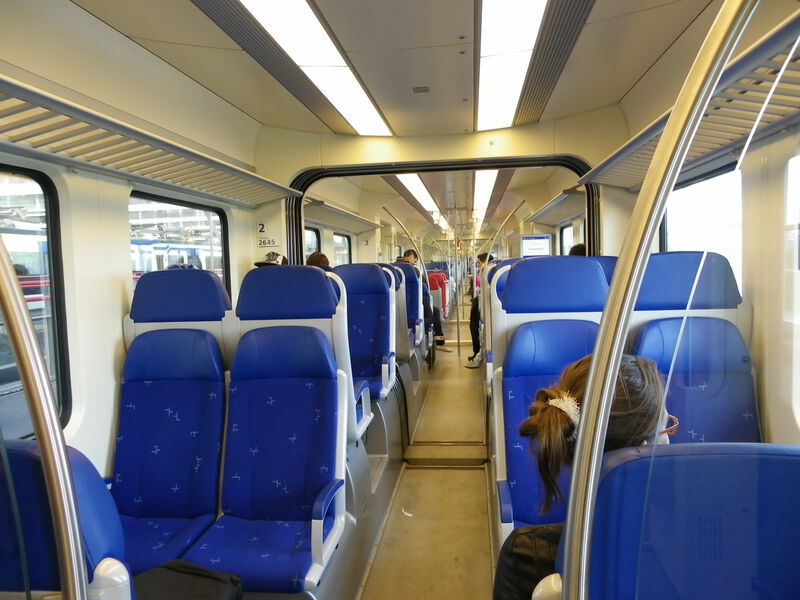 Inside a modern Sprinter train of class 2600. Picture close to the Duivendrecht station 23.5.2011 by Ilkka Siissalo. First class of a modern Sprinter train. Who wants to pay 50% more to be able to sit on a red bench instead of a similar blue one in a short distance regional train? Not too many - unless there is one hell of a crowd packing into the train, which during some rush hours may be a good reason. Picture close to the Amstel station 23.5.2011 by Ilkka Siissalo. A sneak peek with a very long zoom lens. The blue and white train on the left is a brand new SNG train (Sprinter Nieuwe Generatie), new generation Sprinter. They are built by the Spanish company CAF and very first ones arrived in the Netherlands in late 2017. In late 2018 they are not yet in regular commercial use. They are also known as CAF Sprinters or NS Civity trains. 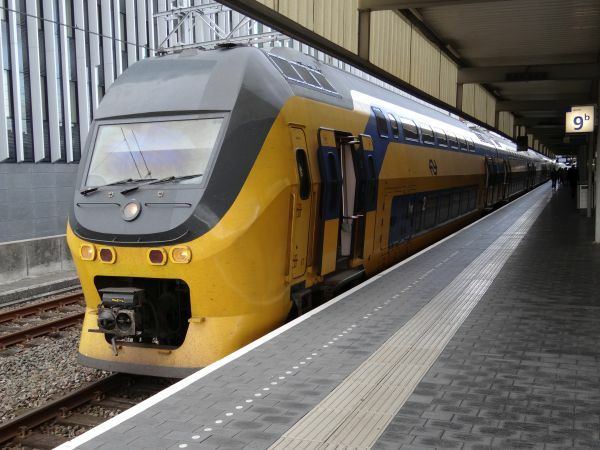 Its top speed is 160 km/h and depending on the variant, it can take up to 358 passengers. 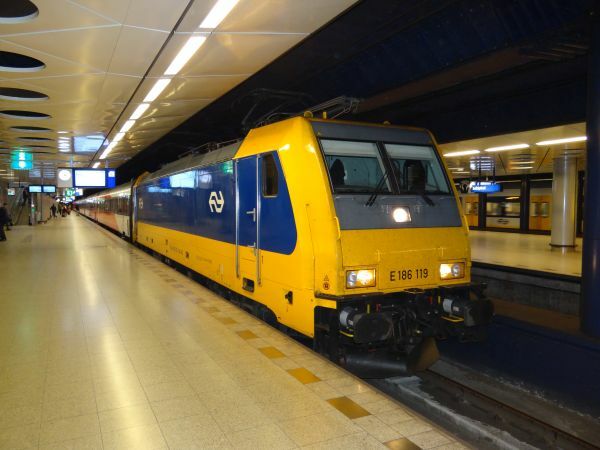 This is the previous generation of NS Sprinter trains, here after their renovation. These are so called SGM-II and SGM-III trains, built by Talbot, now Bombardier, in two batches, 1979 and 1984. They were totally renovated, SGM-II 2008-09 and SGM-III 2003-2006. 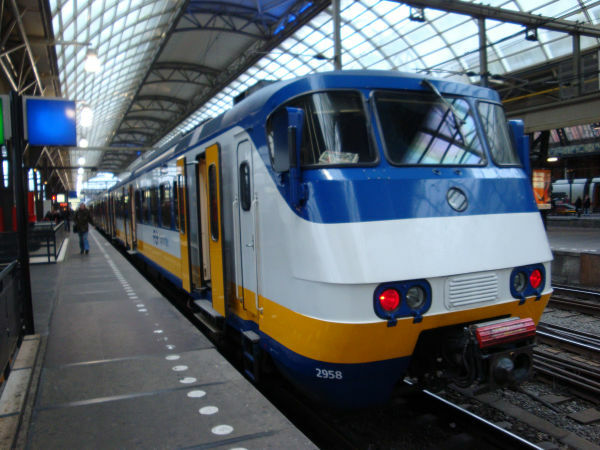 SGM stands for Stadsgewestelijk Materieel or suburban rolling stock. This one is an SGM-III and renovated, therefore it would be called SBMm (m=modernised). Picture at Amsterdam Centraal 10.3.2009 by Ilkka Siissalo. 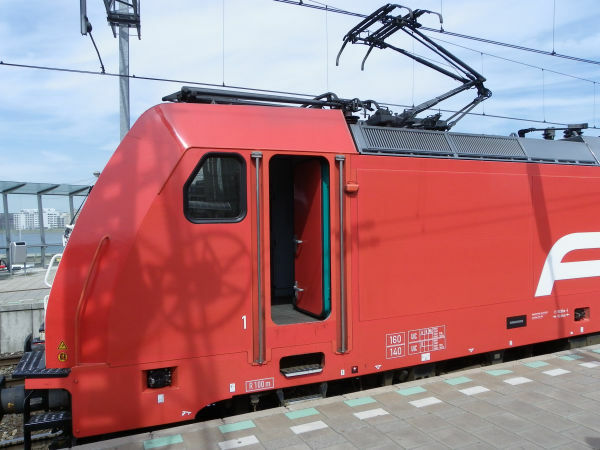 This is how the same SGM Sprinter trains looked like before modernisation. They all went one by one through a modernisation programme in Randers in Denmark and the last ones were modernised during 2006. Before that they were painted yellow with blue "Adidas stripes", similar to the Hondekop trains. 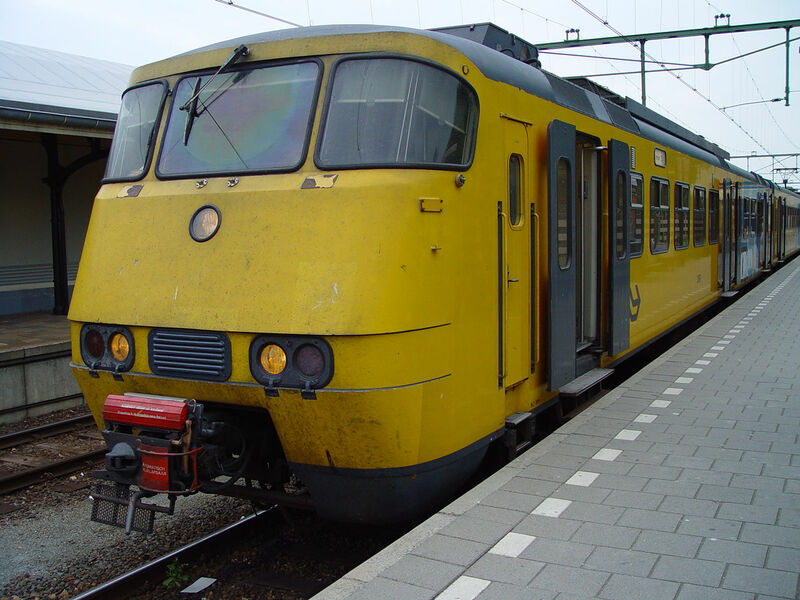 Picture 7.7.2004 of an unmodernised first generation Sprinter train from Den Helder station by Ilkka Siissalo. 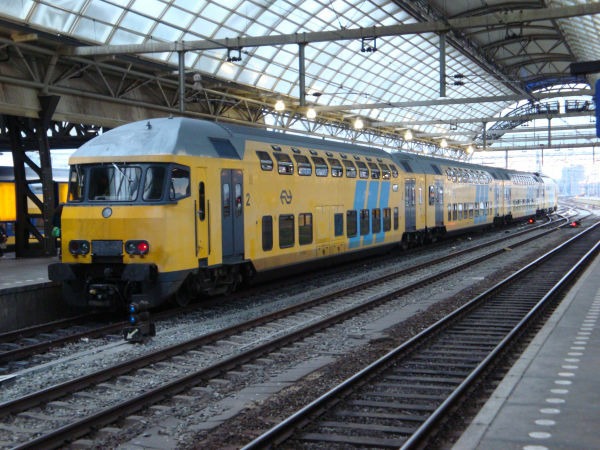 This train is nicknamed "Hondekop", dog's head. Officially the type is called Mat '64 or Materieel 64. 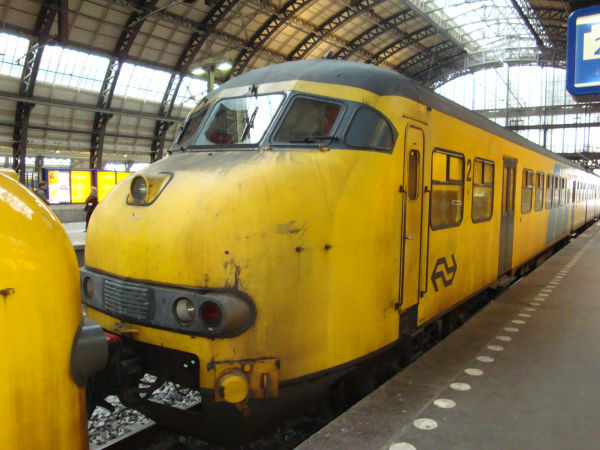 They were built by Werkspoor and later by Düwag and Waggonfabrik Talbot between 1961 and 1976. The last ones were taken out of service in 2016. Originally the Hondekops were dark green and they had a painted white "smiling face", which made the design look even more as a dog's head. There were two variants, Plan T, built 1961-65 and Plan V, built 1966-76. Plan T was more rare: only 31 copies were built, whereas Plan V was made in 246 copies. They differed in their seating. The hondekops were used not only by NS, but also by the private operators Arriva, Connexxion and Veolia, often as leased NS trains while waiting for newer, already ordered trains. This one is a Mat '64 Plan V train. Picture from Zwolle 21.3.2011 by Ilkka Siissalo. Two Hondekop units forming together a regional train and here stopping at the station of Goes. Picture from Goes 10.5.2002 by Ilkka Siissalo. 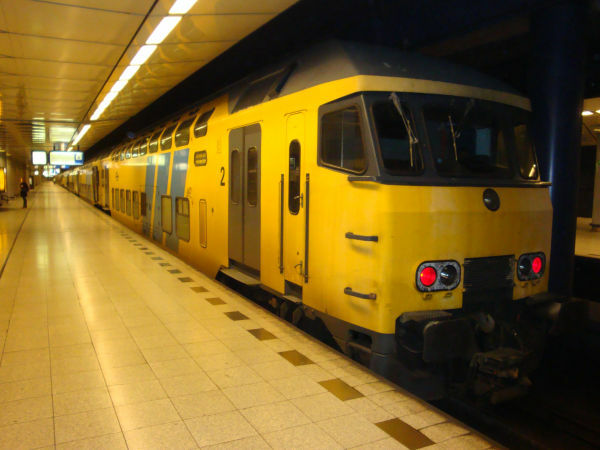 Two Hondekop units forming together a regional train before the time of the modern Sprinter units. Picture from Amsterdam Centraal 10.3.2009 by Ilkka Siissalo. Two Hondekop units, now taken out of use and kept only for museal purposes. The green one is in the livery used when the trains were new. The same two Hondekop units as above. These doubledecker trains were a short time ago a not so uncommon sight, especially near Amsterdam and especially during rush hour peak traffic. This train is called DD-AR or Dubbeldeksaggloregiomaterieel (double decker agglomeration area regional rolling stock). They were made by Waggonfabrik Talbot, De Dietrich Ferroviaire and Adtranz 1992-94 and in another batch 1997-98. It's a train only for short runs, but with a large number of passengers, stopping often. 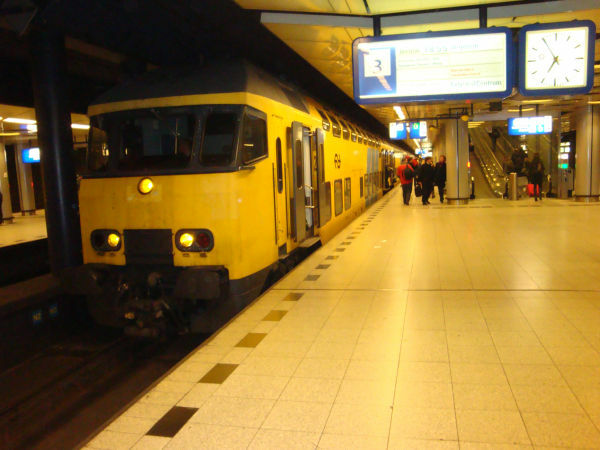 These trains were also known as "DubbelDekkerZonering". They consisted of a driving trailer (driver's cab coach), a class Bv 280 double decker middle coach (one per train if the motor unit was an mDDM motor coach, in case of a class 1700 locomotive instead there could be two per train), then an ABv 380 coach (doubledecker with both 1st and 2nd class) and finally an mDDM 390 motorised doubledecker or instead a locomotive of the class 1700. In this picture we see the unmotorised doubledecker driver's cab coach first. Picture from Schiphol airport station 9.3.2009 by Ilkka Siissalo. This is another DD-AR train different from above, and this again is the driver's cab control coach first. NS used to have 50 of the motorised mDDM coaches, plus a number of these trains used always to run with class 1700 locomotives. 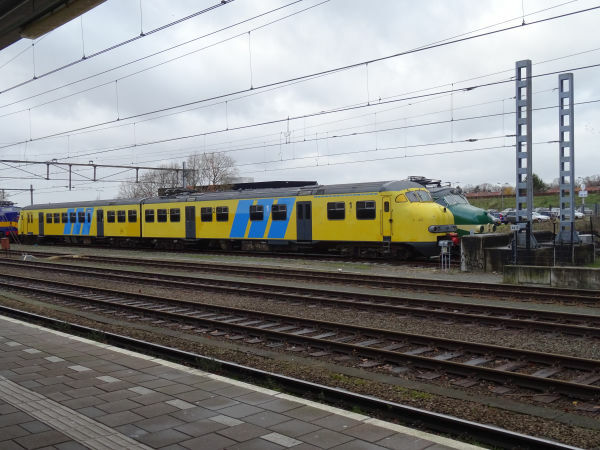 Now in 2018 most of the mDDMs have been taken out of service, but class 1700 locomotive powered doubledecker trains composed of these same coaches are no seldom sight. The combination of a class 1700 locomotive with a rake of doubledecker coaches originally belonging to a DD-AR train, but often with an extra 2nd class coach, just like here with he locomotive 1719, is a common sight still today in suburban traffic of Amsterdam. This again is a typical DD-AR train and with the unmotorised driver's cab coach first. Same train as in the picture above, but the other end. This is now the mDDM powered coach. Upstairs people have a normal upper deck for their use, but downstairs is just an engine room.